Viki's first martial art is Wing Chun, which she learnt whilst living in Hong Kong from 2000 to 2002. She has subsequently practised Yang style Taijiquan as well. Viki is a fully qualified Beauty therapist, Masseur and alternative therapist. She offers Waxing, Facials and Tinting as well as a number of Massage and Alternative therapies including Therapeutic Massage, TuiNa, Reflexology, Reiki and Sound and Crystal Therapy. Chris and Viki formed the North Cornwall Oriental Arts Association in 2004, teaching classes in their home town of Bude, England in Ip Man Wing Chun and Yang style Tai Chi. They have been teaching since this time and on moving to New Zealand in 2009 started this group to offer instruction in the Chinese martial arts of Tai Chi and Wing Chun in Whakatane, New Zealand. Chris started martial arts at age 20, gaining a brown belt in Shotokai Karate before taking up the Chinese arts of Wing Chun and Taijiquan (tai chi), which he has practised for more than 12 years now. He has trained with talented teachers in both the UK and Hong Kong. He studied Wing Chun for 2 years with Jake Seal in Reading before a 6 month period of intensive training in Hong Kong in sifu Ip Chun's class and with his senior student and certified instructor of Ip Chun, Sean Bardoe. 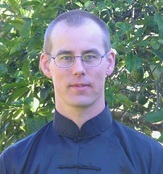 He has studied Yang style Tai Chi with Alan Ellerton in Reading, UK and more recently a Wu style short form with Charlie Baxter in Whakatane. Chris ran his own Chinese Martial Arts club in Bude, UK for 6 years, during which time he trained frequently with sifu Bill McKay of Somerset Wing Chun. He is also a fully qualified Massage Therapist, offering a range of therapies including Sports Massage, Chinese Acupressure Massage (TuiNa) and Reflexology.